Following recent news and the positive key findings of the market study and public consultations, BCF Business Law is proud to affirm its strong support and active role within the group of business people and corporations working diligently to bring back a Major League Baseball team to Montreal. The tireless efforts of the group of Montreal-based business leaders should be commended: congratulations to its leader Stephen Bronfman, Executive Chairman, Claridge Inc., and his partners Pierre Boivin, President and CEO, Claridge Inc., Alain Bouchard, Founder and Executive Chairman of the Board of Alimentation Couche-Tard, Mitch Garber, Chairman of the Board of Cirque du Soleil and Invest in Canada, Eric Boyko Co-Founder, President and CEO of Stingray Digital Group Inc. and Stéphane Crétier, Founder, Chairman, President and CEO of Garda as well as to Richard Epstein, Partner and Board Member of BCF Business Law, and William Jegher, Partner, Transaction Advisory Services and Quebec Real Estate Leader at EY. “The consultations have shown there is not only a strong interest and positivity from businesses and fans for the return of a Major League Baseball team to Montreal, but that it would also be viable and sustainable for our City”, as Richard Epstein explained. “I want to congratulate Richard and the BCF team involved, as well as William and his colleagues at EY, for their passion and devotion for the benefit of the Montreal community. Working together with the group has put Montreal at the forefront to achieve the ultimate goal of bringing an MLB franchise back to Montreal as soon as possible”, said Mario Charpentier, Managing Partner at BCF Business Law. In the coming months, the Montreal group will be sharing the findings of these consultations as well as the results of the market study with MLB. 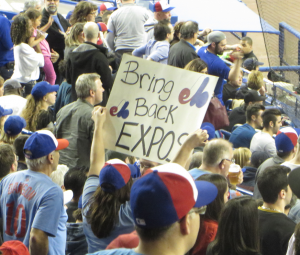 While the process remains complex and is still ongoing, the Montreal group remains firmly committed to bringing back an MLB franchise to the first city in Canada to ever have an MLB team. The City of Montreal, like us, would welcome back Nos Amours with open arms.